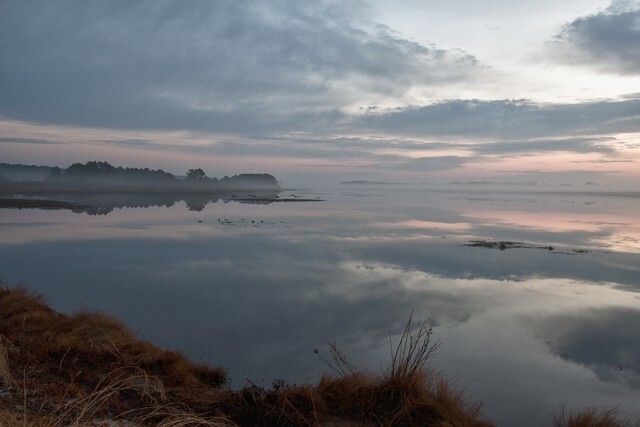 In late November I returned for my fourth trip to the Chincoteague National Wildlife Refuge. 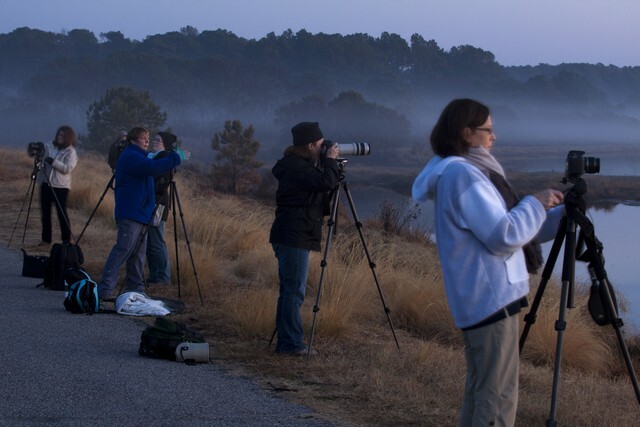 This time I travelled with eight others, all members of the South Jersey Camera Club. This was one of the many field trips the club sponsors during the year, and it was a fun and productive trip. Full Disclosure: We broke out eaaarrrrly Saturday morning to capture the sunrise, and I discovered that my camera was still in bed … back home. I had all but one of my lenses, my filters, and my tripod and all other gear that we carry … but … no … camera. So ashamed. Fortunately there were three other spare bodies available so the weekend wasn’t a total loss. And, the companionship made up for it. Our field trip leader, Pat, had us out on the grinder at (it seemed like) 4:00 AM, actually more like 5:45. We drove out to the parking area for the wildlife loop road and proceeded on foot with our flashlights in pursuit of a 7:00 AM sunrise. There was a wonderful ground fog above which the scraggly pines stood starkly. Sure enough, the dawn light began to illuminate the Snow Goose Pool and we could begin to make sense of things. The opening image above was one I captured just as the sun broke above the horizon. Here’s most of the group that dawn. There were things to photograph on both sides of the road. Here’s another scene that morning before the sun had actually risen. These two images show why it was good for us to be there at that time. Our leader, Pat, and colleague, Larry, had both come down a day early and had scouted out locations for us. After that session we returned for breakfast and planned the rest of our day. 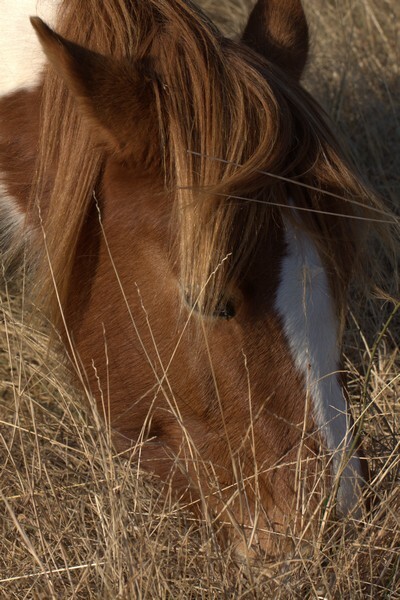 That included scouting out some interesting wading bird shots and also the famous wild ponies. 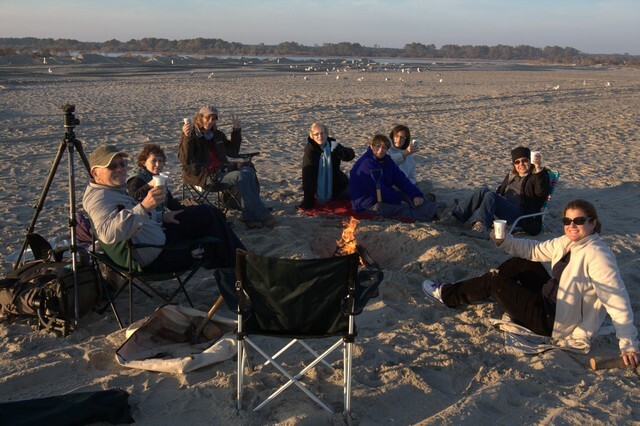 The day concluded with pleasant relaxing around a bonfire on the beach in the long shadows of the setting sun. Spent in the arms of another man’s wife. My Mother, God bless her. A splendid field trip with some wonderful people. Great images Ralph and such a fun weekend!!! 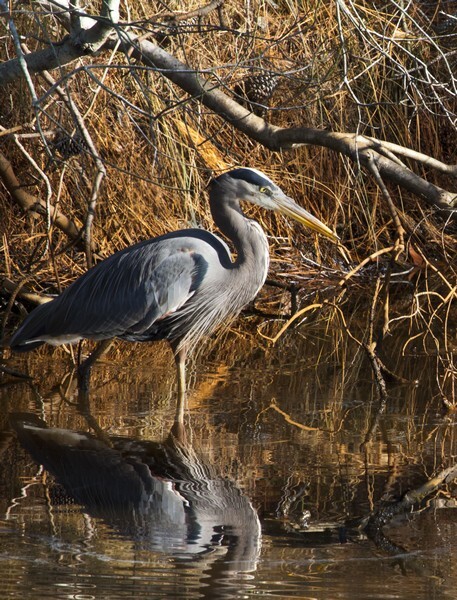 Love your Great Blue Heron capture!! Those early mornings out at the crack of dawn are so worth it. Your pictures of the sunrise show why. Beautiful images. You tell no lies — it was a GREAT trip! Congrats on getting a 9 on that first image! A wonderful trip with great company. Congrats on all of your images – they are beautiful. Thank you for another great story. 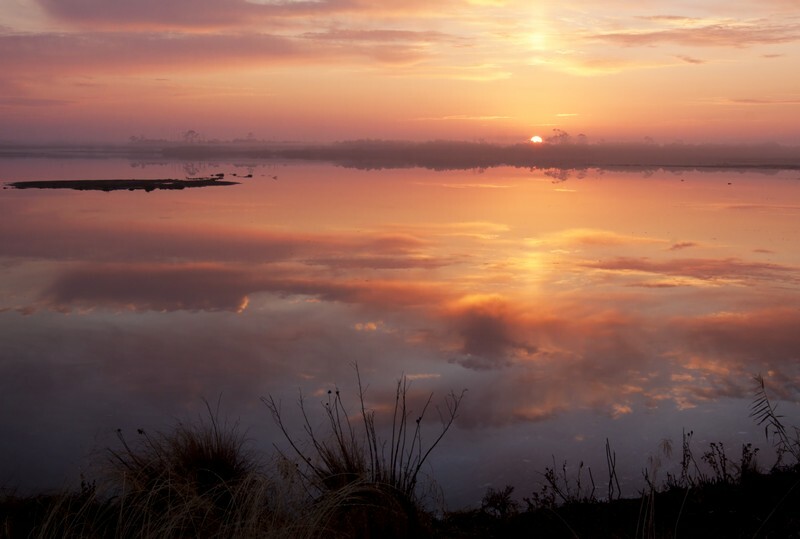 That opening sunrise photograph is one of the most beautiful sunrises I have ever seen. Definitely worth getting up early!! Wow, more great pictures from that trip. Looks like you all had a great time. Ralph, Thanks for the glowing report on the field trip (I will pay you later LOL). Good weather, good times, and good friends, make good photos! I especially love your first shot! Your words brought back a lot of fond memories of the trip. Thank you for the wonderful story. I guess it is time for me to process my shots, too. Ralph – I loved this post. We had planned to go there this fall, but Sandy interfered. You have made me determined to get there again next year. I especially love your first photo. So serene it looks like a painting. Great work as always!! DO it, Sally, It’s a different kind of seashore than ours. Less than 5 hours from LBI. Next best time is probably March for migratory birds. Birds are used to bi-ped gawkers. I recommend either the Great Western or the Refuge Inn, both just at the entrance to the refuge. It will have to be next – we will be in Colorado until late May this year with a bike trip to Sicily in April (if the bodies hold out). Keep up the great work – I love checking out your pictures. Thank you for a real nice synopsis of our field trip. Once again I enjoyed viewing your images. Beautiful tribute at the end…. sometimes just being out there with the like minded clan is what it is all about. Mike, you woud have enjoyd it and added to it. Enjoyed the posting, Ralph. My wife and I were just down there too, but because of her current physical condition could not get out to see the sunrise. Was able to capture a sunset though on the loop road. Thanks, Ken. I saw some of your fine work on your F/B posts. Thanks to all for your kind comments, including those of you who were among the select. It was fun. My favorite place in the whole world. Beautiful photographs.